Join us as we highlight the most important tips for Fourth of July pet safety, and keep the holiday safe for the four-legged members of your family. Keep them home – Parties, parades, and fireworks displays are not appropriate for pets. This not only cuts down on the stress your pet may experience at being surrounded by strange people and loud noises, it also eliminates the risk that you may need to leave your pet in the car if they aren’t welcome. Pets should never be left in cars, even when parked in the shade with the windows cracked, as it can lead to dangerous overheating or death. Make them comfortable – Whether you’re going out, staying in, or inviting guests to your home, make sure your pet is comfortable and secure. Keep the windows closed, and turn on a fan or play the radio or TV to drown out the noise of fireworks. If you will have visitors entering and exiting the home, place your pet in a secure, quiet room with water, bedding, and toys to prevent accidental escape. Reduce anxiety – Pressure-based products, such as the Thundershirt, can be helpful in reducing a pet’s sensitivity to loud noises. If your pet suffers from extreme noise-related anxiety, talk with your veterinarian about a prescription sedative. Update IDs – Fear and stress can cause even the most loyal pet to try to escape your home. Even if you don’t plan on taking your pet anywhere, they should wear a collar with up-to-date ID tags at all times. If your pet is microchipped (which we highly recommend), make sure the chip is updated with your current contact information. Exercise and health – Exercise your pet early in the day to burn off excess energy and reduce anxiety. Be sure to provide plenty of fresh water throughout the day, as nervous pets can easily become dehydrated. Do not allow your pet to consume any table scraps, party food, or alcohol. Inspect all gates and fences ahead of time, and ask all guests to close and latch doors and gates behind them to prevent against accidental pet escape. Don’t allow your pet to be near sparklers, glow sticks, or fireworks. Clean up immediately after a party, barbeque, or fireworks to prevent pets from ingesting dangerous items. 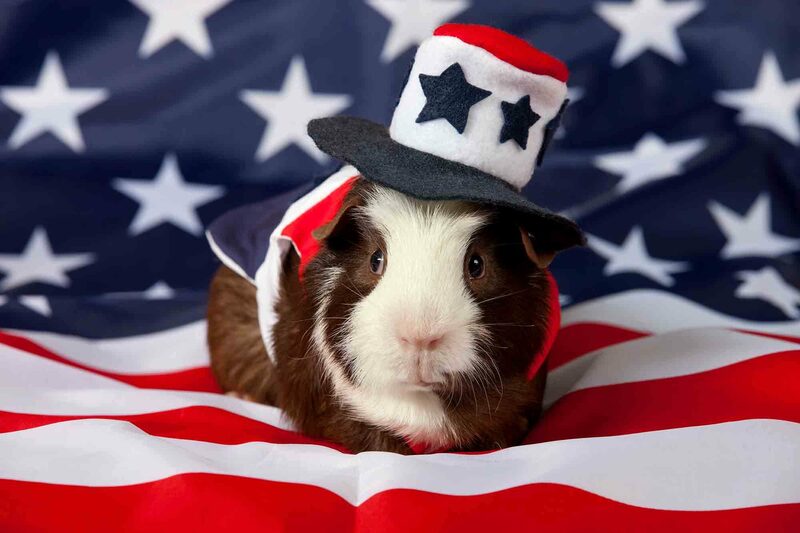 When Fourth of July pet safety is taken seriously, our pets stand a greater chance of making it through comfortably to the next day. Please don’t hesitate to contact your team at Harris Parkway Animal Hospital with your questions and concerns.